Super Junior’s maknae Kyuhyun whose group is enjoying the biggest popularity in Korea as well as Asia is an idol star that warms your heart. Super Junior made Asia wild through their hit songs like Don’t Don and Sorry Sorry. Aside from being part of the big title Super Junior, he recently showed off his new side with Super Junior-M and S.M. The Ballad and received big popularity in Japan, Taiwan, China and other countries. Kyuhyun also became a new rising newcomer in musicals with his superb acting of D’Artagnan in the musical The Three Musketeers. Even though it was his first musical, the musical industry took notice of his remarkable singing talent, ability to lead the story and his natural acting skills. 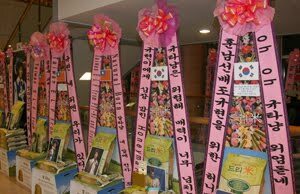 The supportive fans sent rice instead of wreaths to Choongmo Art Hall where the musical performances are held. It was touching as the star and his fans’ heartwarming thoughts were conveyed to the less unfortunate who have to spend the cold winter alone. Kyuhyun said on January 25th that he will be sending over 2000 kilograms of rice to Yeouido Gospel Seongbuk church which he attends. Kyuhyun, a born believer of Yeouido Gospel Seongbuk church developed his belief by attending the church’s preschool and kindergarten. Since he was a child, he volunteered by playing the violin in the ensemble class and when he was in middle school, he played the clarinet. When the church was divided to multiple places, he continued his life as a believer in Yeouido Gospel Seongbuk church. Kyuhyun’s mother Deacon Kim Hannah has worked as the leader of a region for over 20 years and has been volunteering in the church choir for 18 years. Kyuhyun who grew up under his mother’s prayers won an award in the bible memorization competition as a young child. He also won an award for his missionary work and diligently attended the church. He is a model student who works hard to spread God’s word and always prays diligently at Sunday masses. Kyuhyun enjoyed big popularity as the vocal of his school band when he attended YeomKwang high school. When he was a 3rd grader in high school, he won a gold medal in 2005 Buddy Contest and also won a bronze medal in Chin Chin Young Adult Gayo Festival, receiving much interest from music producers. When Kyuhyun graduated high school, he was a member of the church’s Praise Ministry team for a short while. That year, Kyuhyun who is handsome, has great singing skills and is composed unlike his young age contracted with SM Entertainment and joined Super Junior as the maknae in 2006. When he was garnering popularity, a completely surprising event occurred in April of 2007. When he and other Super junior members were going home after recording KBS 2FM Super Junior’s Kiss the Radio, the van that they were rode on rolled over. Kyuhyun fell 200 meters down as a result, breaking his ribs and pelvic bones. When his ribs broke, it also caused damage to his lung. When the accident occurred, Kyuhyun knelt down on his knees and called God. He confessed, “God, I was wrong. Forgive me. Thank you God” and lost consciousness afterward. He confessed the first thing that came into his mind was that he neglected God because he was busy with his schedule. When Kyuhyun’s fans and his family heard about the accident, they attended morning mass and started their planned prayers. The fans’ encouragement and prayers were a big strength to Kyuhyun. On the fifth month of receiving treatment, Kyuhyun participated in Super Junior’s second album even though he had not fully recovered. Many fans sent applause to Kyuhyun who survived his moment of death and stood on stage once again. SM The Ballad song “Miss You” was originally owned by SHINee. The history of this beautiful song clear storied on the blog entry of the composer “Miss You”. [Blog Entry] S.M The Ballad – The History Behind “Miss You” ? M-Wave will be hosting a special winter concert on December 17th and 18th. The concert will be held at the Young Pyong Resort. The concert will begin around 9 PM KST and last for appoximately two hours. Guests are invited to watch the show. Recently the performance list was revealed for both concert days. Check it out below!